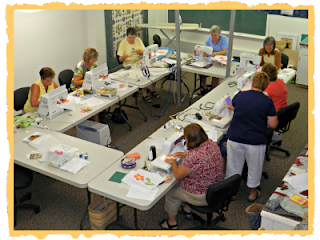 Today we had a full class of lovely ladies learning Machine Applique. Lynda Zonneveld, a long time employee of The Quilting Bee was the instructor. By the sounds coming from the room I believe they all had a good time. Lunch was provided with the help of Nellie Zonneveld. It was delicious except for the peppers in the salad ... I don't like peppers. One lady came all the way from Windsor and I overheard her saying "the class was well worth the trip". Always great to hear.